Some dogs are known to have a blue hue to their coat. Whether you are adopting one or just favor the color, we have put together a themed list of names that just might match up to your new pal. 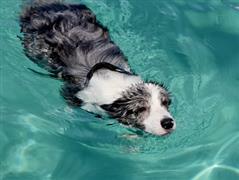 If your dog has a love for the water, you might consider an H2O based title. Rain, Ocean, and Brooke are a few ideas to help get your feet wet. While Blue itself is a classic identity, more owners are turning to the shades. Your dog might be more of a Sky, Teal, or Cyan. Dendro is a unique idea borrowed from Dendrobates azureus which is a poison dart frog with a dark blue coloring. On the less deadly side of the fence, you could go with Jay after the birds found throughout North America. Perhaps a favorite cartoon character is more up your alley. Huckleberry, Smurf, Grover, and Gonzo are all eager to share a color and a name with your canine. Some of our pages will contain a subcategory. A subcategory is a slightly more specific grouping than the main topic of the page. For a subcategory, we will include a separated table of names and corresponding descriptions. An example of a subcategory of Red Dog Names would be 'Dog Names Inspired by Red Wines'. If you have any subcategory ideas for the Blue Dog Names page, we would love to hear them. Use the form below to submit your ideas.